Every once in a while, something happens in the world that makes you want to take you and your loved ones to a remote island, and pretend that the rest of the world doesn’t exit. Today, such a tragedy occurred. My children are of the age of the many who were murdered in Connecticut today. I was unaware of what was happening while I was at work, thank goodness, and while my children were at their school. As soon as I realized what had happened (blessing and curse of having a Smart Phone), I felt what every parent, grand-parent, aunt and uncle, brother and sister, felt: Nausea, fear, grief, anger, and loss. As I wrestled with these feelings, tears welled in my eyes, and all I could think, was “This could happen anywhere.” My children sang happily in the back seat of my car as I tried my best to act as I always do, but I really felt a deep sadness, and dread, and fear. We all have our own things we turn to at these times to help us make sense of what happened. Some turn to prayer. I turned to my practice. As my anger toward the individual who robbed us all of our sense of security rose; as my grief for the loss of all those young lives rose; as my terror of the world around us rose; I looked at what was going on in my head. “Stories,” I mumbled to myself as I swept away images of myself waiting nervously to hear if my child was alive or not; “Future, fantasy,” I muttered again as I pictured my daughter’s terrified face at hearing the sounds of bullets ringing through her classroom. Those are the images that bring us nightmares, fear and anxiety; those are the thoughts that bring us despair for the world around us. They are natural thoughts, but unreliable as they are not grounded in fact — they are our imagination, and best set aside, not given the legs to run around. Letting those images take us over to cause those feelings of terror is what gives that act of violence power. More power than it deserves to have, power perhaps beyond its original intent. We have the ability to take that power away by casting those thoughts aside. Letting those images go gives US power to fully indulge in the embrace we give our children when we are done with the commute home. It lets us hear the words of the happy song that they were singing while we were terrifying ourselves … while we let that gunman into our minds. It lets us understand that we need to love each other now, hold each other now, enjoy everything that is right now. Because now is the only thing that is certain. And while on the one hand that may sound scary, what could be more secure than that which you can feel and see and hear? “Sherrrrrrrrry, Sherry baby …” followed by giggles. When perceived with a mind and ears not clouded by thoughts of what might (or might not) be, nothing is more reassuring. 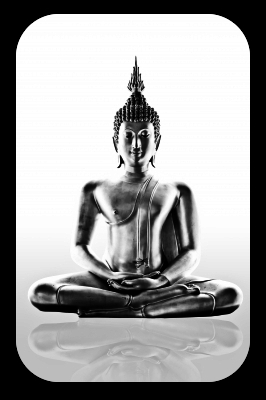 What The Buddha Said … Or Did He? This is just “a little something” I came across while doing some hunting and pecking online for another essay I’ve been working on and has to do with all those little quotes we see on Twitter, Facebook, posters, greeting cards, coffee mugs, Android and iOS apps and anywhere else you can think of. You’ve probably seen them: Buddha Bless is one common source of these quotes that I’ve seen my friends posting on Facebook, but there are others, too. This, according to brainyquote.com is something that the Buddha said. Now, because I’m not familiar with the suttas and this is a line that I’ve never heard being referred to before, I wanted to be able to cite in my signature exactly where this came from — as in which sutta/teaching what have you. So, I searched further by plugging in the whole quote into ask.com with “Who said ‘quote’?” Lo and behold, among top in search results was Fake Buddha Quotes, and specifically, it pointed out the fact that this quote is NOT one of Sid’s. Fake Buddha Quotes is a blog kept by someone I haven’t managed to identify yet, but is full of quotes found circulating online and elsewhere. This individual, since 2009, has been finding and receiving e-mails about quotes found here and there, and figuring out if they are real or not. What’s great about this blog is, that not only does this person tell us if the quote is real or not, he or she also does the research to figure out what the actual source is, if possible! Even if the quote is true, he or she backs it up with a reference to the particular sutta from which it comes. I’ve really enjoyed going through this blog, as there are the occasional pieces in which the blogger has had to defend himself/herself from readers who apparently don’t like the fact that this person is identifying fake from real quotes, or other issues that come up here and there. This writer very skillfully defends his/her position, and regardless of the verity of the quote, the reader always comes away feeling like they’ve learned something. I’m not much of a blog reader really — I find reading on the computer uncomfortable and awkward, so I tend not to do it much — but I’ve gone through much of the archived blog posts and enjoyed finding out that many, many of the quotes that various of my friends put up, are in fact attributable to more (relatively) modern sources, and definitely not Buddhist sources. So I guess the question is, why shouldwe care if a “Buddha quote” turns out not to be so Buddhist? Well, I know for myself, had I just popped up that quote into my signature, and later found out it wasn’t in fact a Buddhist quote, I would have felt rather silly — especially since I would have had to admit that “I Googled it” and didn’t actually get the quote from an ‘acutal Buddhist source.’ Finding out the truth led me to more learning, more knowledge, and, it hasn’t prevented me one bit from using the quote in my signature. I just won’t look the fool by attributing it to someone who didn’t actually say it! Rather, I’ve given it the attribution of ‘unkown,’ as the blogger’s research led to multiple possible sources, and in the end, was inconclusive. If what the Buddha would have thought doesn’t really concern you, we could also point to the practice of Right Speech. Would blindly letting someone tell me the Buddha said something be skillful of me? Would I be contributing to spreading a false impression of something that someone said? Also, what about those people who are the actual originators of those quotes? Do they not deserve credit for that intellectual property? Of course, when push comes to shove, I shouldn’t really let my search stop at reading up on the Fake Buddha blog. If I were being a GOOD studier of Buddhism, I really should go and see if this blogger’s information is right, by checking the information out myself, too. He does make the information awfully easy to find as he points directly to the sources. Perhaps I will sometime … when I don’t have my child whining at me that she can’t find the remote, when the dishes aren’t piling up, dust bunnies under the couch aren’t taunting me and rapidly multiplying, and lessons aren’t sitting around waiting to be planned. I’m just heartened to know that there are people out there doing the hard work of research so laypeople like me can depend on them for right information. Thanks to all of you! So there’s this bouquet of dried flowers my mother keeps on a wall in her house. It’s like a lot of other dried flowers that people keep — it’s from a bunch of roses that someone gave her a long time ago, and in an attempt to preserve that special moment, the beauty of the bouquet, or what have you, she dried it, and hung it up. I remember doing that too, except that I wanted to keep the unusual color of the bloom for as long as I could, so following the advice of some friends, I lacquered the rose with lots of sticky hair spray and carefully dried it. 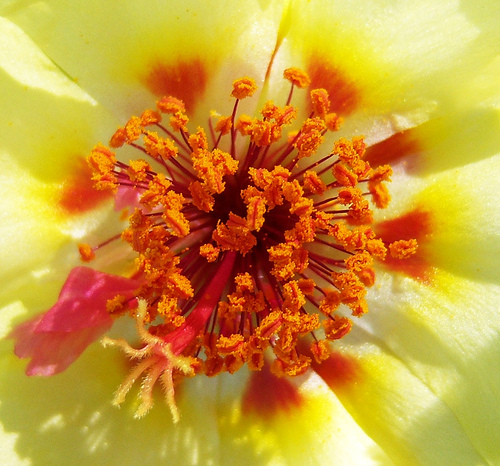 This is a good example of our very human attempts to hold on to a special moment — everything from replaying it in our minds, to preserving anything that we may connect with it, whether it be a ticket stub, flowers, airplane tickets or anything else. We hope in holding on to these things, that we can relive the joy of the moment, that excitement we felt as the bouquet was handed over, or of the camaraderie we felt with the group of friends with which we went on a trip. Ever notice, though, that in recalling these moments, you get that twinge of ‘nostalgia,’ or regret, of sadness? That, that twinge, is ‘dukkha.’ For some, that twinge could be the ‘stab of sadness’ that send us over the edge and into tears, and depending on the situation and our disposition, into absolute sadness — the kind that makes us want to hide away from the world. 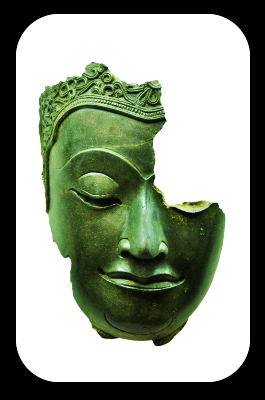 In Buddhism, part of helping us get rid of ‘duhkkha,’ or what in English gets roughly translated as ‘suffering,’ is accepting the idea of impermanence — that is to say, that nothing stays the same. Everything changes, grows, wilts, and dies. There is no ‘unchanging self,’ either — this central core of a person who never changes. On the surface, you might say “Well yeah, duh,” but what do YOU own in your home that is evidence of trying to preserve that which cannot be preserved? We all have them, and they are all causing us some form of dukkha, if you think about it hard enough. My blog isn’t really about that today, it really addresses more of the issue that crops up on occasion with those who look at Buddhism from the outside. Part of what we do in Buddhism, is to reduce the amount of dukkha in our lives. In doing so, we do things like acknowledge impermanence, the absence of that Central Self that doesn’t change, we try not to cling, and let go as best we can of our attachments. To those who are new to Buddhism, this may sound like Buddhists aren’t allowed to care about anything, aren’t allowed to have feelings, reactions, or recollections. It also might sound to some as though we couldn’t have the ability to have moral or values, either. It’s a difficult point to make to those who look at Buddhism and hear us say things like ‘no self,’ ‘no attachment,’ ‘no clinging’ and such. The reality is, that it is quite the contrary. We of course have our families, our spouses, our friends, and of course our possessions. The difference in how we view them and their place in life in general — NOT how we love them, or whether or not we love them. The point I’m trying to make can be found by going back to my mother’s house. On that particular weekend, my family and I had the pleasure of going up to visit her, and also see her sister (my namesake), her sister-in-law, and my cousin. I hadn’t seen any of these people in just about 30 years! Of course I had *some* anxieties over this meeting: Would I remember my Japanese? Would I understand what they were saying? How would my husband feel around them, not having ANY knowledge of the Japanese language? What about my kids? Would they be able to bond with their Japanese family in such a short time? Finally: When would my tears come? Because I knew they would. Having walked the Buddhist path for about two year now, I don’t feel really experienced by any means, but I am helped when facing these kinds of situations. In the past, I would have been wracked with anxiety, losing sleep for days before hand and letting my stomach churn with nerves, hoping that people are just as I remembered them. Feeling sad at the idea that perhaps some people may look older than I remember them, and thinking how sad that would be. On a more visceral level, I would yearn for those days of childhood when I felt embraced by my Japanese family — especially my one aunt, my mother’s sister. Now, however, I fully recognized the fact that they’d look nothing like the picture in my mind, which was formed when I was 8 years old. In those 30 years, they have lost family members, I have lost family members, we’ve gotten married, had children, been hired, fired, and changed jobs, gained and lost weight, wrinkles, gray hairs, and more. Years and distance have changed the dynamics of our relationship, as they should, but they would have even if I had stayed in touch with them or lived in Japan with them. Things change, that’s what life’s about. Again, sounds obvious, but if you look closely at that ‘twinge’ feeling you get when you think about your childhood, you’ll see that you’re holding on to that memory, and wishing for it to come back. So, when approaching this situation now, instead of feeling really anxious, I was able to approach it with more curiosity than anything. I was also fairly excited — but in a good way. Not a nervous way. Knowing that people change in fundamental ways, because there is no unchanging self, I had no real expectations or hope, per se, as to how my ‘favorite’ aunt would be. My recollection of her was as a warm-hearted, soft, energetic, fun-loving woman. I had no real idea if she were the same at all, or of how my cousin would be, or how my second visiting aunt would be. I was able to let go of any expectations that I might otherwise have had, and was really able to enjoy seeing them this weekend. We carved pumpkins (which was a new one on them), enjoyed some delicious Japanese comfort food (home made, yum! ), strolled down memory lane and got to know each other all over again. I was able to do all that with no let-downs, and through simply enjoying the moment as it presented itself. I believe it’s called ‘equanimity.’ Perhaps I’m wrong in saying that’s what this was, but that’s what it felt like. It really is, the daily struggle! That grind that you feel like you’re just pushing yourself through. That’s really what I’ve been encountering these last couple of months. The last time I posted anything, we were in the long, lazy days of summer. While I had plenty to keep me busy, I did have time to just sit and write, and think about what I was going to write, to give my study of Buddhism a lot of time, attention, and thought. Then, it all fell apart. As the school year approached, there was a whole new routine to adjust to, and my schedule this school year hasn’t worked out in a way so as to afford me much free time. I’m finding myself dragging stacks of work home to grade and correct, and tons of lessons to try to plan out — not even ahead of time. Just to keep my nose above water. As these stresses piled up, I found myself letting things go here and there — the first thing, was exercise (ack!). Then, it was my reading of anything, on Buddhism or otherwise. Slowly but surely, my meditation practice also disappeared and eventually, I’m feeling like my life has been swallowed whole by the Stress Monster. A few days ago I was sitting here feeling like a big failure — I’m a Fake Buddhist, I told myself. A Real Buddhist wouldn’t give up their meditation practice because they got tired or stressed out. They wouldn’t stop studying because they had too much work to do. A Real Buddhist would find a way to make it All Work, right? Now, the reasonable part of my brain realizes a few things: 1) I would probably be less stressed out if I DID let myself set my work aside and make more time for exercise and meditation. After all, those two things are the meat of stress-management; 2) No one is perfect; and 3) This is what accepting impermanence and change is all about — not letting yourself get all bummed out because things changed, and not seeing yourself as a Bad Person or a Fake anything because you felt that you had to set one thing aside for a while in exchange for something else. That being said, no matter how much you try to be at peace with this fact, it’s hard to see a state that you were quite happy with change, and change in a direction you don’t like. I love studying buddhism, I was really pleased with my meditation and exercise routines — they both just balanced out my days nicely. In the past, a change like this in my life would have done a lot of bad things to me — avoidance (sinking into video games, eating, or just generally finding something to help me avoid ALL THINGS, including work and family), and anger in general, striking out in all directions OUTWARDLY — that would be blaming everything and everyone around me, but not looking AT ME. Instead, I’ve made myself take a look at what’s happening INSIDE. Why am I doing this? Are all the changes I’ve made for the good? What can I do differently to make me feel at least a little happier? Am I making the best choices (intent) in general? I’m thinking this is an example of how having a buddhist practice that you’ve groomed can come into play in your life when things get tough — it’s taught me to look at the issue head on, and make sure I’m on The Path — right intent, right action, and also at Why I’m Doing This. I know there are things I can do differently, and I’m hoping that I’ve correctly identified them, and hoping to get back to some things I’ve had to set aside — my main outlets which include writing, reading, exercising and meditating. It’s not happening all at once, but I’ve started with making sure I find time to stir exercise and reading back into my day. Next up are going back to writing (I’ve had several blog posts in the works and just “never have time” to finish! ), and meditating. Unfortunately, there are some things I can’t change — for now, I’m having to set aside my group in Second Life, as well as the area I’ve set up for the reading group in SL. Preparing for discussions unfortunately takes more time than I have — at least, preparing for them the way *I* think I should 😉 That being said, I have plans to try to start a study group in the summer … we’ll see. But that’s OK, it’s all about change, accepting the change, and not allowing myself to be attached to a set of expectations. For now, I’m doing what I can, when I can. I remember this mantra from when I first started my studies … how did I let myself forget???? 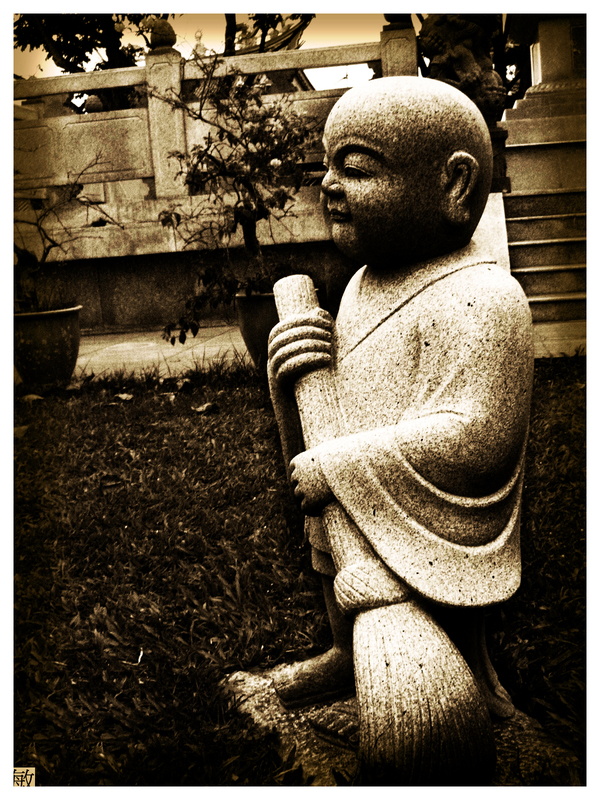 Sangha — What’s In A Word? Like Buddhism itself, the meaning of the word "sangha" has shifted over time. One may feel the need to say 'goodbye' to the ancient word and use a new one that is more relevant to Western practitioners. Sangha is the third jewel and refuge on the Buddhist path. In the West there are many opportunities to cultivate and develop this jewel in a modern setting. We can learn from all the different models we can find, from traditional hierarchical ones or more modern consensual ones. Each will teach us and support us differently. This is a very important aspect of the practice that Westerners who come to Buddhism cannot ignore. It is inspiring that people are being creative in finding new ways to create meaningful communities. 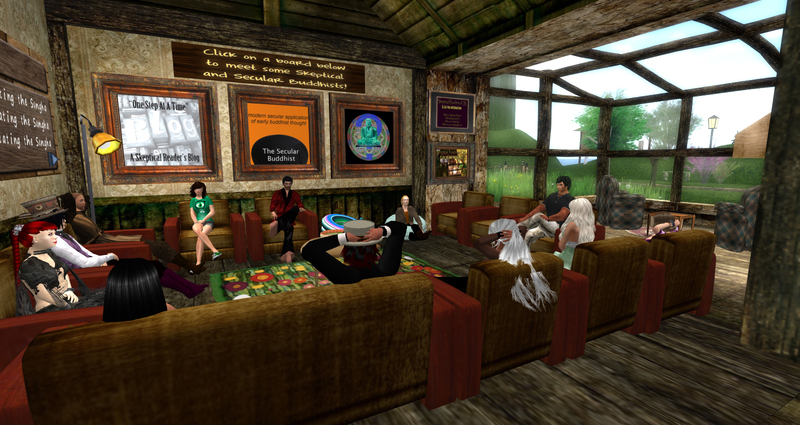 Over the past few weeks, the Skeptical Readers of SL reading club has gotten together to talk about an article by Stephen Batchelor, called “Creating Sangha”. The article talks about what “sangha” means — right from what it was when Buddhists first gathered to practice, to what it appears to have come to mean in modern, Western practice. For those who are completely new to the term, Sangha is a community of monks and/or nuns who devoted their lives to attaining Enlightenment. Martine Batchelor’s article quoted above explores the various attempts in Western cultures to adopt the notion of sangha in Western culture, both for those who might have the opportunity to practice as a monastic, and for those who are lay practitioners (like myself!). As Buddhism developed over centuries in different cultures, its form was determined by the economic and social conditions of former times. All traditional forms of Buddhism share in common the stamp of a medieval social structure. They emerged in societies with fixed class distinctions in which the course of a person’s life was determined at the time of his or her birth. The division between monastics and laity was as sharply defined as the division between classes. The life of the majority of the laity consisted of agricultural labor and the raising of families. A formal education was very limited if not absent. Monastics, in contrast, were largely free from having to engage in manual labor and had no family responsibilities. They were able to devote themselves entirely to the Dharma: through the study of philosophy, the practice of meditation and by serving a pastoral role in the community. Stephen then goes on to question whether in today’s modern, industrialized, Western culture, if there is still the need for monastics such as has existed previously. During our group’s discussion, I believe we unanimously agreed that in the context of OUR culture, there is no need for this structure. Monks and nuns really aren’t as needed as they were previously. We live in an age when public education makes literacy *almost* universal. Access to information is *almost* even across the plane. Inequalities do exist, but unlike in Buddha’s time, most people today learn to read, write, do math, use a computer and more. Speaking of computers, they also have made information more easily accessible. We also have much more leisure time (though some may be hard pressed to agree — I’m making PBJs and fetching milk for my kids between paragraphs). I no longer need to seek out a Buddhist monk to give me the teachings. I can Google it, verify that the information is good, and use it if I so choose. I can commune with individuals on Facebook, in Second Life, and on various other discussion forums. Don’t mistake me, we all still need teachers, and personally, I do see value in the existence of those who are able to devote their time to attending retreats and on their own, closely examining the teachings, right from their original forms in Pali or Sanskrit. Many people who do just that are, in fact, monks and nuns. In our North American and European cultures, there are many who do become ordained monks and nuns. There are many others who do not, because we have the reality of familial and/or professional obligations and commitments to which we cannot or do not wish to stray. Those individuals, however, may yet pursue knowledge in the field of Buddhism without becoming ordained. I’m lucky enough to have learned a great deal from people who have never been ordained, but know a LOT about the teachings in Pali, about Buddhism, and what the Buddha taught. In many ways, to my eyes, these academics are our modern-day ‘monks,’ to whom I don’t give bowls of rice … but who do give me invaluable pieces of insight and information. often) in Second Life consider our group of peers our “sangha.” Could Sid have EVER imagined that one day, in a virtual 3-D environment, humans would have gathered to discuss, talk, and learn about his teachings? Would he have considered that to be a Sangha? What is the essential in the idea of Sangha, that third pillar of what is called the Triple Gem? If we take away the idea of having monks be a part of the group that gathers, talks, learns and teaches about Sid’s words, is it no longer a ‘Sangha’? If we’re not going to call it “Sangha,” what should we call it? 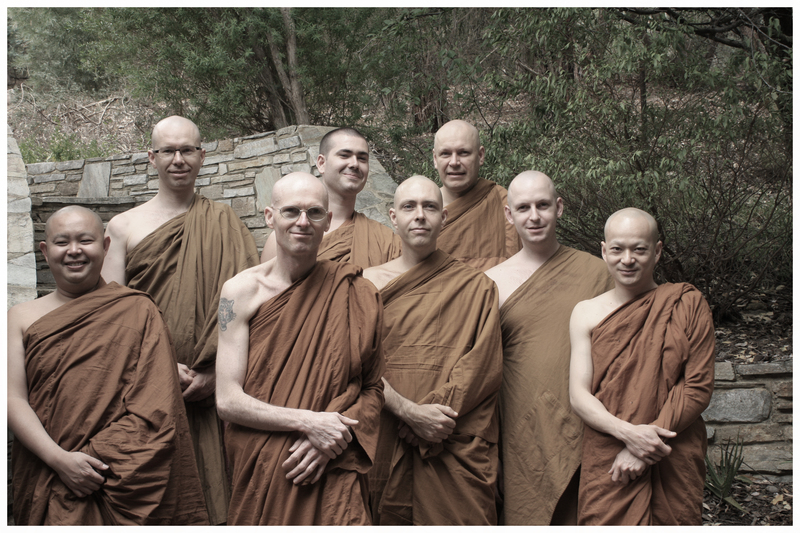 Would we still call our practice ‘Buddhism’ if we don’t have monks in our sangha? Christians have ‘church,’ in Islam we have ‘mosk,’ in Judaism we have ‘temple.’ What should the new Buddhists have? Ultimately, the answer probably doesn’t matter. Perhaps then, neither does the label — both the label of ‘sangha’ and of ‘Buddhism’. For the sake of simplicity, though, wouldn’t we want a word? Would sticking to ‘Sangha’ really be so terrible? Or would something in a romance language be more apropos? After all, what is in a word? We all value our gatherings, and basically consider the spirit of ‘sangha’ to be present in our gatherings and the groups that exist in this virtual platform. This includes Second life, Facebook, our various blogs and web sites, too. Specifically considering Secular Buddhist communities, it is probably in our best interest to try to unify the various groups scattered throughout the virtual environment into one cohesively networked unit. Networking with additional, existing Western Buddhist groups in Second Life would help connect with other like-minded Buddhists who may not yet have discovered Secular or the closely-related Skeptical Buddhism. Most of all, to further the development of a strong practice in our culture, continued, mindful discussions on topics such as this are very important. Do consider following any one of my links, and engaging in a healthy discussion on a message board somewhere, post a comment here, or just join a group to learn more. The more you engage, the healthier our practice will be. Hopefully, I’ll get to meet you soon! Buddhist principles have their place in everyday household routines -- and even help alleviate some of the stress associated with doing them! Housework — it’s that thing in our lives most of us dread doing. I used to get very frustrated that my house didn’t look like it belonged in a magazine even after hours of cleaning. That frustration would grow when, just moments after I polished off a surface, food would get eaten, crumbs would fall onto the counter, dishes would begin to make their grubby presence known in a once sparkling, pristine sink, and a bread bag would get left open on the kitchen table, hanging open and growing more stale — and ugly — by the passing moment. Feelings of resentment toward those with whom I co-habitate would grow: Why can’t they just pick up after themselves? Why am I the only one who seems to know how to replace the roll of toilet paper in this house??? Does no one else know how to wash a dish? Turn on the washing machine? Make the bed? Put dishes away???? Good lord! I’d love to be able to say that Buddhism helped me see through the fog of all this resentment which, by the way, usually results in complete avoidance of the tasks that need to be done to remedy the situation (“Why should I do the dishes again, I just did them! It’s ‘someone else’s turn now.”) To be honest, there is another source that helped me work through all of this. This other source, though, I’ve grown to find shares common threads with Buddhism. That’s my topic for today — That, and how the Other Source AND the Buddhist point of view have helped me with the issue of resenting housework. Perhaps some of you already know about FlyLady . Despite this strange name (which she explains on her web site, along with what FLYing is), she offers words of wisdom that really snapped me into reality when it comes to everyday living. Her mantra, “Jump in where you are,” urges those who feel that they are drowning in the “should do’s” around their house to just start — anywhere. Because if we wait for that perfect moment before we start cleaning, we’ll never get started. Nothing will change unless we just start SOMEWHERE. Through a routine which she helps individuals establish through her Baby Steps, she instills in those who subscribe to her e-mail service (and Web site) this idea of cleaning, and shedding what we in Buddhism would call dukka. She refers to what we would consider ‘labeling’ and ‘judging’ as ‘negative talk’ and gives examples through testimonials sent in by subscribers of how these things causes our own suffering. After a while, we see her message is one of letting go of expectations and accepting impermanence. Another common theme in her daily messages is the letting go of the idea of ‘Perfect’ (a big part of expectations). She tells us to clean, dust, put things away, and “put out hotspots” (clear surface area clutter) for anywhere from 7 to 15 minutes, whatever fits into our schedules. The important thing being, to just do it. Whatever it is, just do it for a few minutes, and STOP. Look. Admire what you’ve done. Slow down. Appreciate … starting to sound familiar? Yeah, once I started looking at Buddhism, it did to me too. Mindfulness 101, here you go. Another good one in the mindfulness category is “Do one job, and finish it. Don’t start another one until you’re done.” It’s the anti-multitasking message which is also part of what being mindful has taught me to do. Concentrate on what you’re doing. Give it your full attention — doing that will allow you to be mindful of your actions, ‘being in the present’ helps us approach aspects of our lives with less anxiety, stress (aka “suffering), and from the FlyLady’s perspective, it allows us to get things out, sort, purge, put away, and actually see the job through to the end. My absolute favorite message of all that belongs to not just Buddhism, but also to the FlyLady, is the Anti-Perfectionism message. If you wait for perfect, you will never start cleaning. If you wait for perfect, you will never be satisfied with what you have. If you strive for perfect, you will hurt yourself, resent those you live with. If you strive for perfect, you will start to perceive your co-habitants as keeping you away from achieving perfect. “Perfect” is an illusion, it’s expectation, it’s dukka! FlyLady nails that idea right on the head, and it’s central to her message of Finally Loving Yourself. My favorite chore of hers she gives us to do once a week? “Vacuum each room, JUST THE MIDDLES (no going along the corners or edges, and NO moving furniture allowed). Set your timer for 10 minutes and STOP!” No matter what. If we think it’s not perfect, she urges us to put the vacuum cleaner down, and take a REAL look at what we’ve done. Notice everything, including the fact that post-“imperfect” vacuuming, the room is already much better than it was. Be happy in that. It’s been about a year now, since my more serious study of Buddhism, FlyLady and I have crossed paths. It’s taken a lot of practice and training of both Buddhism AND FLYing to get myself there, but I can now happily say that I hang the laundry on the line and feel thankful for the few minutes to do what I call a “standing meditation” — that is, notice the hanging laundry, the motions, the breath, the thoughts, label my past, future and thoughts of fantasy, set them aside, and bring my mind back onto my task with equanimity — no resentment, no grumbling, no expectations. Dishes get the same treatment, as does any other chore. The result? Not a perfect house, but people can walk in any time, and we’re not mortified any more (FLY Lady calles that “C.H.A.O.S. [Can’t Have Anyone Over Syndrome]”), and best of all, I’m not angry any more — no mess to make me stressed, no resentment while cleaning, which means happier me, happier kids, happier everyone all around. Since beginning my studies of Buddhism and really taking a look at how I view the world we live in, and how I approach the events that arise in it, I’ve been surprised at times at how what I’m learning about will crop up in my daily life. I do try to meditate here and there, grab snippets of time for study (reading articles and blogs to learn myself up!) and sangha time. Mostly, though, my life is about being a mom, a wife, and a secondary school teacher. Brushing my hair with a peanut-butter smeared hair brush and rushing in to work with dried up kids’ toothpaste smeared on my work pants is just daily reality for me; more so than thinking about dhamma and mindfulness, the eightfold path or the four noble truths. That’s hardly the image I see in my mind when I think “Buddhist.” You know, serene, calm, golden aura all around this unflappable person. A BUDDHIST. That Buddhist, is not me. It’s not most of us. That being said, there are moments in this daily life in which the teachings will just scream out to me, and I’ll find something we talked about during sangha, or something that I read about popping into my head and out of my mouth. My kids are still pretty young — 7 and almost 5 — so very impressionable and still in the shaping phase of their lives. I hope they pick up a couple of things here and there. A few days ago, I had what in the teaching world we call a “teachable moment.” It’s that moment, completely unexpected, when you have a golden opportunity to impart some knowledge on someone, and THEY are the ones who are asking for it, and are fully ready to receive. I had such a moment when my son’s heart almost audibly broke when he realized he would NOT be getting an iPod touch any time soon. We had to tell him that an iPod costs about $229 for a brand new one, and that most kids his age don’t get their own. He is, currently, exposed to a couple of his friends who DO have their own — and also have their own TV in their room, their own computers, and who knows WHAT else. We had to explain to him that on the salaries of two public school teachers, there just really wasn’t any way that we’d afford a $229 present for him … and that it would take him the better part of almost two years on his current allowance to save up for his own iPod. I’m sure this is a familiar speech for most of us — either because we got the same speech from our parents, or because you’ve given the same speech to your own children, or both. What’s this? Dukkha? Suffering? Coveting? Attachment and ambition causing suffering? I think I would have used almost those exact words, honestly, regardless of my having studied the Four Noble Truths or the Eightfold Path, or anything else about Buddhism. The difference, though, is that I now feel that I have a deeper understanding of the message in those words. Rather than repeating in an empty way, something that my parents told me, there is a more fully developed Intent (yes, with the capital “I” because, I mean the Buddhist Intent) behind the words I am using to communicate with my son. I can also back it up by example in how I lead my own life. It’s not just something I say, it’s also what I do. As a teacher, I call that ‘modeling,’ and it is considered the most effective way of communicating a behavioral concept. I don’t know that he’ll get it, although not being biased AT ALL (haha) I think he will. I don’t necessarily want he or my daughter to be Buddhist — it may not be ‘for them.’ I do, however, want them both to learn to be TRULY happy. If I’ve learned anything in my studies, it is that happiness comes from where we are NOW, appreciating our reality the way it IS. That’s not just a Buddhist concept anyway. Take the Latin expression ‘carpe diem’ — ‘seize the day.’ While the origin behind that expression is not necessarily the same as the Buddhist ideal of ‘living in the moment,’ it shows an awareness of the importance of the here and now. You hear that platitude “Yesterday is past, tomorrow is a dream, today is a gift, that’s why they call it ‘the present,'” (which makes me want to gag, as an aside), which also demonstrates that awareness of the need to appreciate the moment, the immediate surroundings and where we are NOW. I’m going to have to thank my children some day for bringing me daily reminders of what is important in everyday life — and for highlighting the teachings for me, even while I’m rinsing out jam from a dress-up princess costume. Anywhoo, there’s a sink full of dishes with my name all over it — someone please find me the dharma in THAT, ok? You are currently browsing the Meanderings category at One Step At A Time.